Classic range of solid wood, wood veneer & black faced racks. Our handmade desks are available in a range of options. StudioRacks Custom – we create customisations of colour, finish, design, shape and size, and we’ll work with you to determine what’s likely to best suit your space and kit. It doesn’t cost as much as you might think! Find out more about our custom service. Now available: the Project Studio Series of studio furniture featuring compact desks The Origin and MiniMaster workstation desks, ready to order online. To give you exactly what you want is the best answer. Currently most of our desks are custom built. 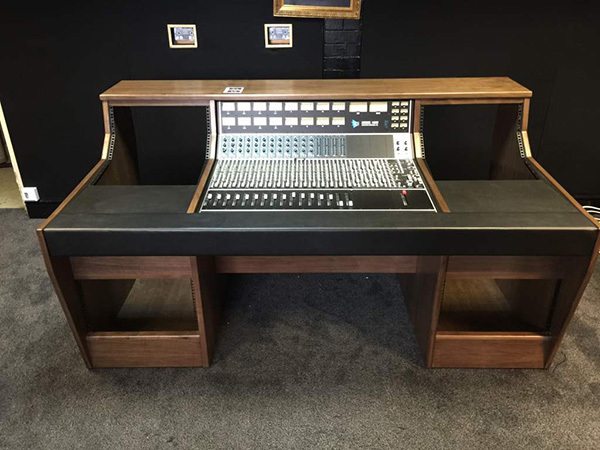 If you’re not exactly sure what you want just yet, a good starting point is to look at the galleries with pictures of studio desks, edit desks, studio workstations and desks with control surfaces and mixers built in. Or send a picture or sketch with your ideas. Adding details such as overall size material finish, equipment to be housed and how you want the desk to work for you will help speed up the generation of a quote. StudioRacks have a very wide range of experience in building and fitting studio furniture, and we are happy to advise you. Size is a key consideration, and the wide range of materials available means it’s impossible to provide a definitive price list. Our quotations will always include charges for delivery and installation. This does limit the areas we’re able to supply, so please contact me to ask about delivery times and feasible delivery locations. The gallery has a large selection of images of our custom work, including images of desks as-delivered, and studio settings which show some fantastic shots of our desks and racks in their working space. You might also want to think about our ready-to-go Project Studio Series desks, The Origin and MiniMaster. Designed with the project studio producer in mind, the designs incorporate our years of experience in working with audio producers and musicians in a compact unit that’s available at an affordable price.